As I'm sure you're already aware, SkyMetro hasn't been getting much attention for a while now, and while we've tried to bring in various managers to keep the server going it just hasn't worked out as we'd hoped. After a lot of deliberation about the current state of SkyMetro and the possibilities for the server moving forward, we have made the difficult decision to close the server. 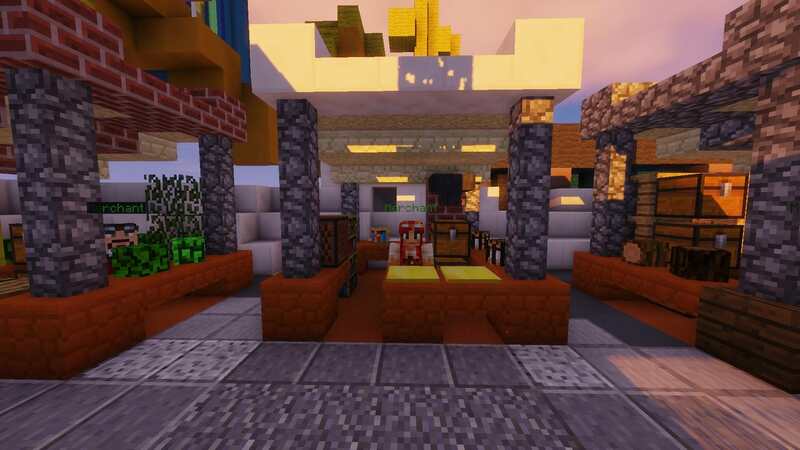 We simply don't have the time and staff to keep the server going to the high standards everyone expects, and we think it would better to give everyone's investment into SkyMetro ranks a new purpose rather than to have them wither away on a server that isn't making progress anyway. 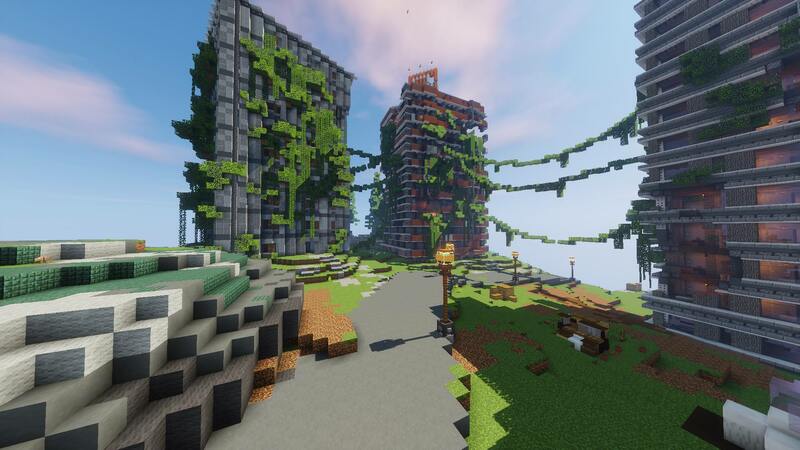 That being said, we will be merging the SkyMetro community into TheArchon - TheArchon is a very well known server in the Minecraft community, famously home to Factions realms, we have recently opened a Skyblock realm called Origins. On this realm we have used a lot of mechanics that were founded here on SkyMetro and incorporated them into a brand new feel to the Skyblock experience. We're really happy with our Season 2 release, and we have big, exciting plans for the future too so make sure you keep up to date. When one door closes, another one opens - I hope to see you all on Origins at TheArchon soon! SkyMetro Season 5 is launching tonight at 6PM EST (roughly 1h 20m from now). Here's a little insight to what this season will contain. There will be a full information post showing off our new features. What's the aim of this season? We've launched our brand new dev realm, which will be accessible to all donators 3 days before a new feature is launched. We've gone ahead and prepared all of our features, and will roll them out to the server weekly. This season was mainly reset to fix up the vast amount of bugs left from previous seasons. It's obviously going to still be very buggy. All content updates will launch weekly, excluding week three. View our update timetable here. For the first time in a while we're offering a PayPal reward for #1 spot. Our YouTuber will be joining us this weekend, and others later in the season. It's an interesting time for SkyMetro, with a poorly launched season (partly myself to blame) and a large lack of playerbase & content. It's time for us to move forward and plan ahead. Earlier this season I promised a lot of content updates for this season, and I never got around to fulfil those promises. If we plan ahead for the next season now, we'll be able to perfect all of the changes & bugs that currently lie around on our server. All formats have been revamped, and soon rule threads & more. All staff permissions have been reconsidered. Idle forum posts (such as reports, applications) have all been archived. These will not be answered, if you wish, you may recreate these posts using new formats. This does mean staff applications, bug reports, player reports, appeals have all been archived. Suggestions have not been archived. Suggestions have been looked into. All of these small changes will help create the new version of the server. To plan ahead, we've decided to archive the bug reports & suggestions sections and fully recreate them, so we know what you want. We've also added a brand new rating system for these sections to verify their accuracy. From now on, we'll summarise all planned changes and progress of the next season. We're going to be focusing heavily on the staff system, how suggestions are implemented, and our response time on all submitted threads. We have also added a changelog section to update you on micro-changes to the server, forums, store and other services such as Discord. Use our brand new suggestions and bug reports sections, we hope to reply to each one within 72 hours. You can also reply below with a long list of suggestions if easier for you! If you have any questions, feel free to ask them below. I'm really looking forward to this future stage, we're going to change whatever the community would like. This update is yours. Hi civilians! In this Metro Weekly, we'll be recapping everything that happened in the past week. A Metro week will begin on a Friday and finish on the Thursday, this means that we can focus certain days accordingly. Let's get on to the article! A very buggy week, but a really good week for progress. We haven't necessarily added much, but we're piling up our content board and getting ready to release a ton of content. Me, Ruu, the developers & @trkey will be reading all of your suggestions in the next week, and implementing the majority that are fitting. Make sure to make your suggestions now! I'll be singing, yes! Winner will get a very large prize ingame and on the store. See you next time, in the content edition of Metro Weekly! We're working on season 4 for SkyMetro. I want to make sure the community is heard before we release Season 4, so please use this thread as a way to voice your opinion on what needs to be added, removed or changed on SkyMetro. @Amazing (the new server manager) and I will be reading your replies & giving our input on your suggestions throughout the next few days. Thank you to everyone that stuck with us throughout the last few months. I look forward to next season! Season 3 is here! Island top winners! Votes can now be saved up and spent in our new vote shop, located next to the crypto shop. Warrior - A strong PvP kit with many custom enchantments. Redstone - A utility kit containing a variety of essential redstone items. Builder - A building kit containing a variety of building blocks. I know it’s been a long time since you’ve received news about updates but we can finally announce the next chapter of SkyMetro, Season 3! On Saturday 10th March 1PM EST we will start closing cities and officially start Season 3. All progress will be reset, including items purchased from the store (ranks and kits will remain). We have some long-awaited content coming with the new season, which we’ll get into shortly. Island Top winners will be announced on the day of the reset. The KoTH gives players a new objective to fight for and is only available at specific times throughout the day. The first player to enter the KoTH arena will start capturing the hill, they will need to hold it for 5 minutes to win the KoTH. It is the job of other players to try their hardest you knock you out of the hill to reset the capture timer. If you manage to hold your enemies off for the 5 minutes required, you will earn a KoTH exclusive supply drop. You will be notified in the chat when KoTHs are starting or already underway. Boss fights give players a new way to obtain loot. Bosses will spawn throughout the day and will take a lot of damage before going down. Killing bosses will drop exclusive supply drops depending on how many players are involved. Remember that PvP is enabled throughout the Nether so other players can kill you during the boss fight. Once the boss has died you will then need to fight for the supply drops if you want to take the rewards. 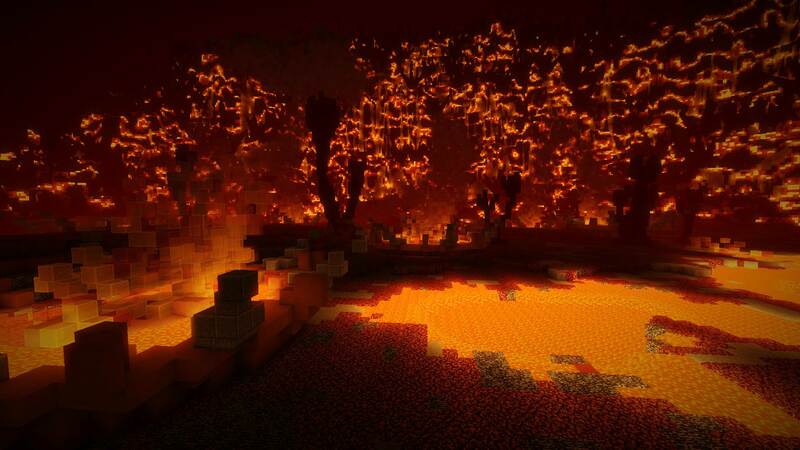 Like the current warzone, the Nether will have ore veins scattered around the map. However, these ore veins are enhanced, with double experience gained from mining blocks and the ability to mine cryptos. In Season 3 levels will be essential for progressing your island and as a player. Various server features will now require a specific level to be unlocked. Island expansions, computer generated blueprints and the crypto shop will have to be unlocked by reaching various levels. The vanilla tier of enchantments will be unlocked from the start, but to generate better enchantments you will need to level up. The initial levelling structure shouldn’t be too difficult, provided you put some time into completing challenges. We’ll monitor how players deal with this system and tweak it accordingly to ensure it’s challenging but not tedious. There will also be rewards for reaching certain levels, including various donator crates and an exclusive “Level” crate for reaching level 60. We’re happy to announce the release of the long-awaited marketplace. Players will take part in auctions to gain temporary ownership of market stalls. Owning a stall allows you to set up a shop in which you can buy/sell items. They function similarly to chest shops, except these stalls are featured in spawn. There are a limited amount of stalls so you’ll have to out-bid other players for a chance to own a stall. Stall owners can also customize their shop with a custom title and description so you can appropriately advertise your products! Drop-ins give players more opportunities to PvP for awesome rewards. You can enter a drop-in with /pvp, which will teleport you to an arena to fight other players once the drop-in begins. Supply drops will fall during the drop-in and players who survive rounds with kills will be rewarded with bonus crypto shards. If you die or leave the drop-in you will not be able to return until the next round. Drop-ins and the other events listed will be the only way to obtain supply drops as they will no longer drop in the already existing warzone. We hope you guys will enjoy these new features and will join us for the release of Season 3. We will have a new YouTuber livestreaming the release of Season 3 so you should be seeing some new faces around the server. We have decided to shut down the Golden city and Luck as we head in to Season 3, leaving just Crimson and Ivory. Purchases that carry over between seasons (ranks and kits) will be transferred to the Ivory city. However, you can make a purchase support thread and request your package on a different city, provided you come to us within the first two weeks of the season. Tax will be moved to Ivory, but the effects will be significantly reduced compared to the current tax percentages. Lucky blocks will be added to both remaining cities. Upon the release of Season 3, we will be adding a vote shop in which players can spend their vote currency. Instead of earning a vote crate, you will now earn a vote token, which you can spend however you like. You can purchase lots of lower tier crates or save up for a much bigger reward. This shop can be found next to the crypto shop. We will also be adding top voter rewards, meaning the top 5 voters each month will receive prizes. As most of you have already noticed, peraldon is no longer working for SkyMetro, meaning small and I have taken over his responsibilities. We’d like to thank him for all his contributions to SkyMetro. As we head into Christmas, we're super excited to announce what we've been working on for the past while. Enter, Lucky City! This is a brand new city that BenMascott and Target3DGaming will record on. To celebrate the launch of Lucky City, we have a neat 20% off the entire store for a short while. You can make the most of it here. Also, we have added Offshore Bank Accounts to the 'Exclusives' section - this is for tax evasion! We have launched a brand new city, called Lucky City. This is our first themed city, and is launching with a number of features exclusive to itself. BenMascott and Target3DGaming will be playing on Lucky City from launch (which is now!). This system is a brand new addition to the Sky Metro network. Tax is collected every Sunday night (discluding 10th, ie today), and your wealth dictates what amount of tax is collected. At launch, the tax will be extremely low, with the various tax bands only taking a small amount. We are expecting this to be under powered, and will slowly increase tax until everyone is happy with where it is at. 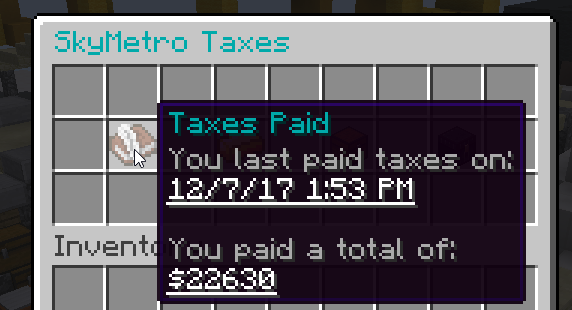 Tax is calculated, and collected from many different places, from bank, inventory, island blocks, chests and more. You can manage the prioritization of all of these, and view lots of tax related information by doing /tax. The catch with the Tax System, is the Offshore Bank accounts. These are separate bank accounts that you can gain access to, either from the store, or rarely through gameplay. They have a maximum amount of $1,000,000 that can be stored in there at any time, however, any money in an Offshore Bank account does not count towards tax. Withdrawing money from an Offshore Bank account can take some time, depending on the size of the withdrawal, so make sure that you manage your money properly throughout the week. If the response to the tax system is a positive one, we will be rolling it out to all cities in the near future! These new items can be gained from using your computer cores to create them. There are 3 kinds of Lucky Block - Slightly, Very and Insanely. They can be opened at spawn, and have a bunch of different effects. Some good, and some really not so good! We will be adding and changing drops in Lucky Blocks frequently, to maintain a sense of random chaos.